Refurbishments are more demanding in terms of logistics, deadlines and construction sequences than is normally the case when planning and handling other projects. In particular, they must not adversely affect ongoing operations or safety and fire protection concepts. At the same time, the original building remains almost intact. It is usually a matter of simply replacing the glazing and sealing systems. 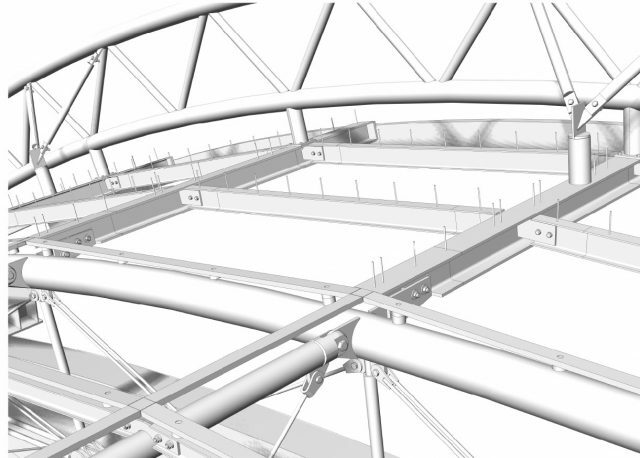 Where possible, the design of the structure is retained and the existing sealing system is renewed or replaced on the basis of the details available. The glazing must be brought up to date and designed to comply with applicable standards and guidelines. The existing windows with built-in blinds at Haus der Geschichte in Bonn were replaced with double screen printed triple insulating glazing with a shading layer. 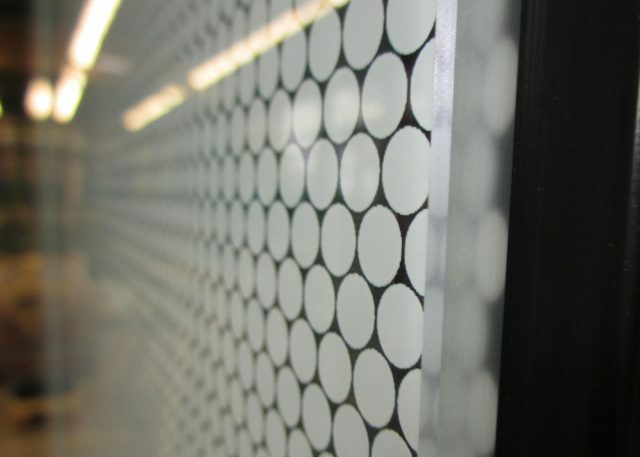 With an 80% imprint level, screen printing acts as a useful solar shading system while at the same time letting in plenty of daylight. All the options for crane access and storage areas at the building to be refurbished have to be explored. In this particular case a crane was erected on an underground car park roof which had been duly reinforced. Particular attention had to be paid to the weather conditions during the refurbishment of the roof, not least because exhibits remained in the museum during the building work. The plan provided for suitable temporary weather enclosures to protect the open building from the rain. 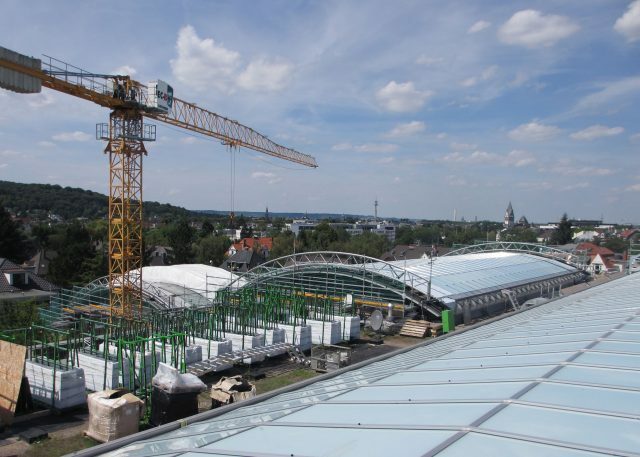 The materials were stored temporarily on the sides of the roof so as to have the least possible impact on museum operations and keep crane operation to a minimum. To this end a suitable storage area with static support measures was created. Having confirmed the technical feasibility of the new insulating glazing, a model was used to provide a visual depiction of the complex system. This also served as evidence of the feasibility of the sophisticated screen printing. 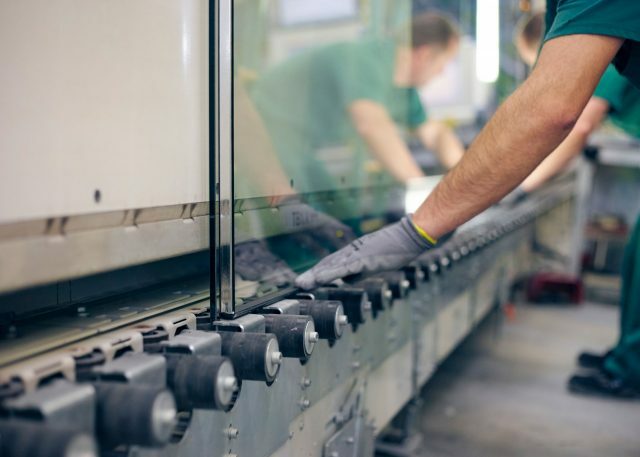 The sealing systems were prefabricated and the glass units to be replaced were made according to assembly groups. Some sections of the roofs awaiting refurbishment were not accessible until work was underway, so a number of panels and elements could not be designed and manufactured until the measurements had been taken. The lack of storage on-site also necessitated just-in-time delivery and assembly. The installation was scheduled during the summer in order to minimize the risks posed by bad weather. Small sections were dismantled in accordance with a schedule drawn up beforehand and fitted with the new sealing system and glass or panel elements. The components were stored directly adjacent to the installation location in order to keep transport times to a minimum. Work was suspended in bad weather. Provision was made for two makeshift covers for sudden, unexpected changes in the weather. The first was a tarpaulin with storm protection which could be laid very quickly, and the second was a motorized temporary roof. 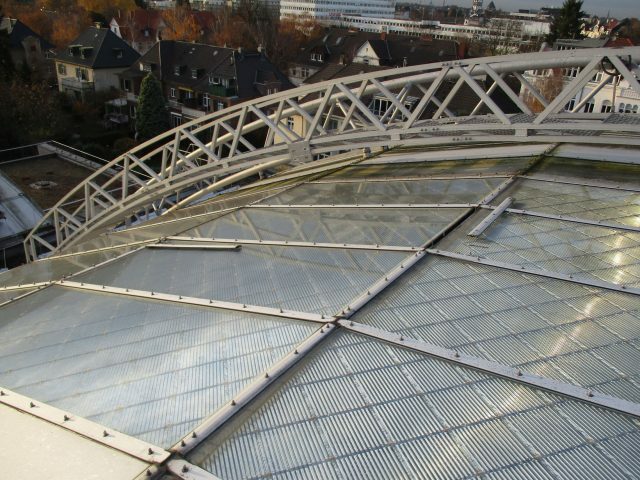 The advantage of the temporary roof was that there was no need to interrupt the work being done on the sealing system underneath: walk-on netting and a weather enclosure allowed the work to continue. This is not an option with the tarpaulin. The more suitable version was chosen depending on the weather situation.